The vintage housewife’s schedule was no doubt much fuller than mine. Back in the day, people used to make a lot of food themselves, rather than just grabbing a bottle, can, box or packet from the shelves. Since the start of my foray into housewifedom I’ve been meaning to attempt to replace some of our store-bought favourites with homemade versions of my own. 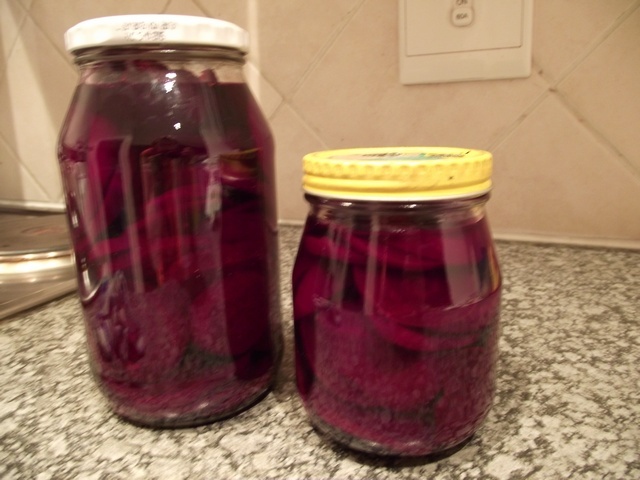 First up: pickled beetroot. I found this recipe online; it seemed easy and came highly recommended (don’t you just love the internet?). I bought some trays of baby beetroot on special, so I had about 16 small beetroot instead of the 4 large ones that the recipe calls for. I managed to make one-and-a-half jars with that, and the pickling liquid was just enough. 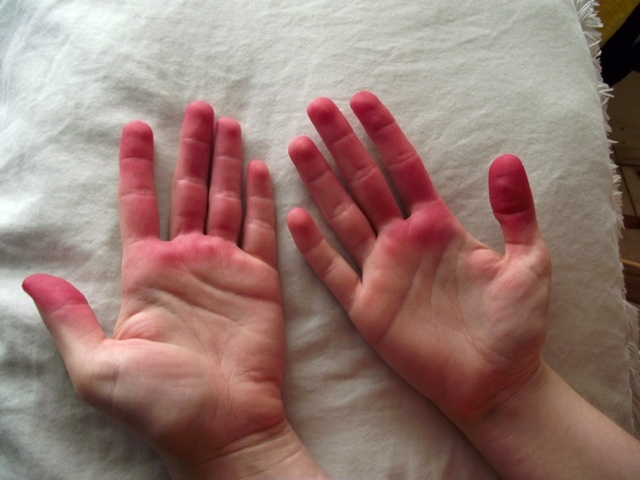 Luckily a bit of soapy water and lemon juice took care of the beetroot juice with ease (though to be a true vintage housewife, I suppose I should have used vinegar and bicarb – the miracle cleaner of the ’50s). I sterilised the jars by rinsing them with vinegar and then using very hot water to wash them out. 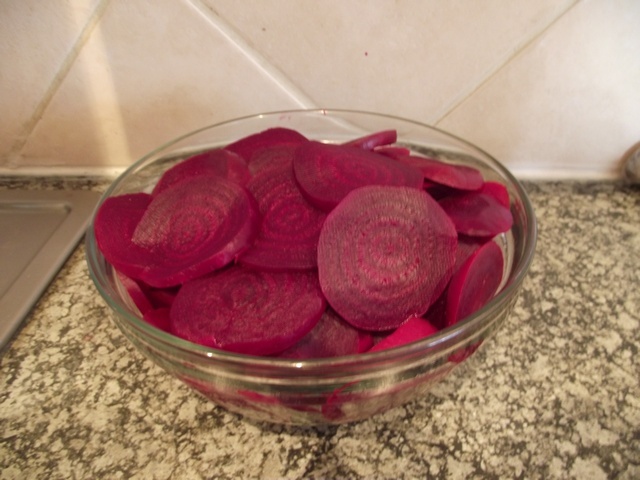 Here’s my sliced beetroot ready to be pickled. The pattern of those growth rings is so pretty, isn’t it? And here’s the final product. Sorry for the amateurish blurry shot; I was in a hurry last night. Unfortunately it will take a few weeks for the flavour to develop, so I can’t give you a verdict on this yet. But the recipe was very easy to follow and is worth a try for that alone. I’m keen to see if this could be the start of a whole range of homemade treats. It’s funny how we’ve raced ahead in our technological era to invent as many time-saving devices and processes as we can, only to discover that we may have lost something special along the way. I enjoy working with fresh food; if I had my own garden I’d be trying out all sorts of homegrown goodies. It’s enjoyable being involved in each part of the pickling process. The smell of the raw beetroot reminds me of that wonderful smell of wet soil after fresh rains. I like the process of cooking the rough, hard bulbs into tender pink veggies with soft skin that slips off easily. I also prefer knowing what goes into my food; no weird preservatives or unhealthy colourants and flavourings. I’d like to do this more regularly for Ninja and I. We’re a long way away from the healthy diet I’d ultimately like us to live on, but it’s a journey of change, and I’m enjoying each step along the way.